Johnson, G. & Howell, A. (2005). Attitude Toward Instructional Technology Following Required Versus Optional WebCT Usage. 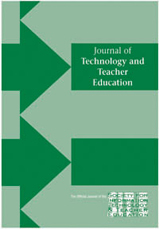 Journal of Technology and Teacher Education, 13 (4), 643-654. Norfolk, VA: Society for Information Technology & Teacher Education. Retrieved April 25, 2019 from https://www.learntechlib.org/primary/p/5112/. WebCT , Inc. (2003) WebCT campus ed i t ion: Br ing ing educa t iona l exce llence on l ine. Retrieved May 26 , 2005 , from http://www.webct.com/ Whetstone , L. , & Carr-Chellman , A. (2001). Preparing preservice teachers to use techno logy : Survey resu l ts. TechTrends , 45 , 11-17 , 45. Windschitl , M. , & Sahl , K. (2002). Tracing teachers’ use of technology in a lap top compu ter schoo l : The in terp lay of teacher be l iefs , soc ia l dynam ics , and ins t i tu t iona l cu l ture. Amer ican Educa t iona l Research Journa l , 39 , 165-205.